We join the Children's Museum of Sonoma County in hoping to inspire children's creativity and stimulate their curiosity! Unique to the Alliance is our affiliation and sponsorship of exhibit space and health programming in the newly built Children’s Museum of Sonoma County. This “Exploratorium”-type museum provides a unique opportunity for our organization to have a physical presence in our community. 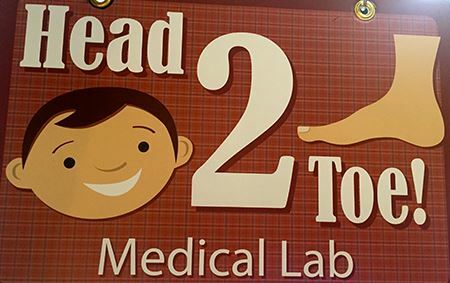 The Head-2-Toe Lab is able to actively engage young children with age-related activities that focus on educating them about health and wellness. We hope you'll make a trip out to the museum to experience the fun learning environment. Children will be able to walk through the Head-2-Toe exhibit doors and put on scrubs and a stethoscope - play in a baby nursery - look at X-rays & microscopes - use a hand-washing teaching station - and even explore organ play toys. Currently, we are looking for docents! "All children are being scientists when they play, but at the Science & Health Lab they get to dress the part, too! Kids can put on lab coats and safety goggles while they "experiment" with different items in the lab. Children can view different specimens under a Wentzscope, a large viewer microscope. Examine a large set of teeth under a magnifying glass or pretend to be a dentist working on a patient. Nearby, they can look at x-rays on the wall of teeth, bones, and other anatomy. Is it the bone of a dog or a human? Is there a fracture? By inquiry, Children can discover the answers to various questions posed in the Science and Health. What is the prognosis for the patient? What does a healthy lung look like as opposed to one that is not? And what might a patient do to live a healthy life?"